A few years ago I was asked by a friend of mine “What five books (excluding the Bible) do you think everyone should read?” I decided to give the question a spin and a few of my blogging buddies are giving me their five reads in their favorite genres. 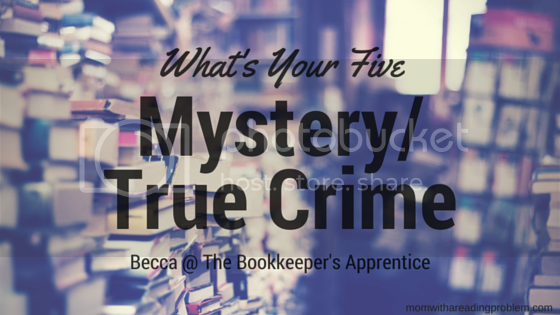 Up today is Becca @ The Bookkeeper’s Apprentice and her favorite genre Mystery/True Crime. Thank you to Lillian for inviting me to do a guest post on her wonderful blog! When Lillian told us about the idea of “my five”, where you pick five books you think everyone should read, I immediately wanted to talk about mystery and true crime. These are the genres I read the most, and that I always reference when someone asks me for book recommendations. So if you’re looking to read some great mystery or true crime, here are five books I would definitely recommend you read! The Suspicions of Mr. Whicher by Kate Summerscale: The Suspicions of Mr. Whicher is, in my opinion, one of the best true crime books ever written—and one I’ve re read multiple times. Summerscale not only expertly lays out the facts and theories of an infamous Victorian crime, but traces the downward spiral of the most famous detective of his time. The Hound of Baskervilles by Arthur Conan Doyle: I love Sherlock Holmes (my dog is even named Sherlock), and The Hound of the Baskervilles is my all-time favorite Sherlock Holmes tale. The eerie setting of the moor, the legend of the hound, the mysterious deaths, and the presence of the famous detective and his faithful Watson make for an incredible tale. The Westing Game by Ellen Raskin: The Westing Game has been my favorite book for over 20 years now, and is one I’ve re read more times than I can count. It has it all-a group of mysterious people stranded together, a perplexing puzzle, tantalizing clues, and an ending that packs a punch. The Devil in the White City by Erik Larson: This book is so, so popular for a reason. It’s a true crime book that managed to grab the attention of people who wouldn’t normally read true crime. Larson has a masterful writing style, and expertly weaves together a crucial moment in history with the tale of one of the most terrifying and prolific serial killers of all time. And Then There Were None by Agatha Christie: No list of my favorites would be complete without a book from Agatha Christie, and And Then There Were None is my absolute favorite Christie work. (The Murder of Roger Ackroyd and Murder on the Orient Express definitely get honorable mentions.) Christie truly is the master of the “the killer is one of us” trope that has become so popular since, and the ending of this book is one you won’t soon forget. What are some of your favorite mysteries and true crime books? Let me know in a comment here, and please come chat with me at my blog or on any of my social media accounts-I love getting to know fellow book lovers! English major. Pre-K teacher. Lover of books. My dog’s name is Sherlock. I collect Agatha Christies and anything Sherlock Holmes. My favorite authors are Agatha Christie, Gillian Flynn, Jennifer McMahon, Marisha Pessl, Kimberly McCreight, Donna Tartt, Erle Stanley Gardner, Ngaio Marsh, P.D. James, Sir Arthur Conan Doyle, Erik Larson, and Will Lavender. Thank you Becca! Love all of Arthur Conan Doyle myself 😉 What’s your favorite Mystery/True Crime read?